Last night I visited some friends and as I was staying the night wanted to take something for them. I decided to make some cookies but not to follow a recipe and have a bit of a play. 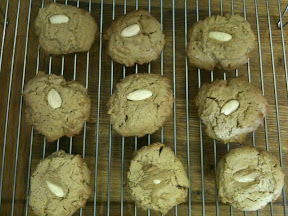 I love dark brown muscavado sugar so wanted to try and get the flavour through in my cookies. Unfortunately I'm not really sure on what quantities I used as I just added a bit of this and a bit of that until the texture looked right. I started by creaming some butter and dark brown muscavado sugar until it was very light and fluffy. I'd say it was about 150g of each. I then added an egg and some self raising flour until it formed a dough consistency (in retrospect half ground almonds would have been a good addition). I put blobs of mixture about the size of golf balls on a greased and lined baking tray and didn't flatten then very much. Just adding a whole almond to the centre of each. I baked them at 160C for about 10 mins until they were slightly golden but still soft in the middle. They made a very crumbly melt in the mouth cookie and the brown sugar taste really did come through. Next time I might add a pinch of salt to the mixture to bring out the flavour more and a sprinkle of sugar to the top of each before baking.